Since its beginning, Brindley Construction has been a part of the Pulaski and South Central Tennessee community. We are proud to support the following organizations and events. We believe in giving back to the community that supports us with their business. 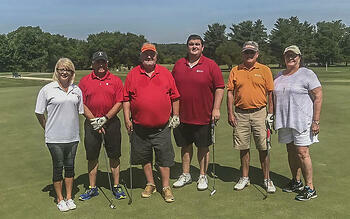 Each year, Brindley proudly sponsors the South Central Tennessee Development District Annual Golf Tournament. Proceeds from the tournament allow the SCTDD to provide assistance to the aging and disabled in the region. The organization is also involved in community and economic development throughout South Central Tennessee. The Brindley staff is always grateful for the opportunity to share experiences with students interested in the construction field. Our team has presented at Richland High School in Lynnville, Tennessee and discussed the importance of the trade and the many opportunities available to those who are willing to learn the business. Soft skills, appearances, resume preparation, understanding drawings, and many other related topics were also introduced. Mary Margaret Brindley, daughter of Ronnie and Daryl Brindley, recently completed a service project benefitting the Giles County Help Center, a local food shelter for the community’s less fortunate. Mary Margaret did a complete renovation to the Center's overflow room, including painting, removing the old wooden shelves and replacing them with metal shelves with casters. She had the sign on the front of the building replaced and also hosted a food drive at Southside Elementary School in the Center's honor. She even went as far as listing the foods they offer their clients and created a menu planner with nutrient guidelines as well as recipes. Mary Margaret continues to provide assistance to the Help Center and is currently working to replace the older shelving in the main stock room. Paying for college can be a challenge. For this reason, Brindley Construction offers tuition benefits to employees’ dependents. The 2018 recipients are Mary Margaret Brindley, daughter of Ronnie Brindley who will be attending Auburn University in the fall; Ty Rose, son of Todd Rose, who will be attending Martin Methodist College right here in Pulaski; Hayden Journey, son of Katie Journey, who will be off to Tennessee College of Applied Technology later this summer; Tyler Morris, son of Tim Morris who will be attending the University of Tennessee; and Marcus Cawthorne, son of Sherry Barr who plans to attend the University of Alabama. 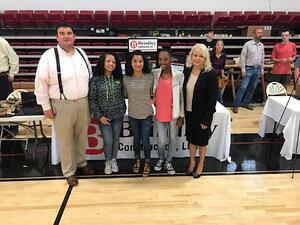 Every year, Brindley participates in the Giles County Career Fair at Martin Methodist College in Pulaski, Tennessee. This is an event for us to connect with Martin Methodist College students and local applicants alike. We value the networking opportunities provided by meeting with those interested in joining the construction industry. Brindley joins other local businesses to sponsor sports parts in our community. This effort is organized by the Pulaski Exchange Club. Kiwanis helps kids around the world. Local clubs, such as The Kiwanis Club of Giles County look out for our communities and the international organization takes on large-scale challenges, such as fighting disease and poverty. Rotary Club of Pulaski members provide service to others, promote integrity, and advance world understanding, goodwill, and peace through our fellowship with business, professional, and community leaders.